Attorney Frank Madena, of the USA is kidnapped and Charles McCabe, an elite member of the Joint Intelligence Agency (JIA) insists upon hiring special field agent Carl Hogan to locate the attorney’s whereabouts. However the JIA aren’t convinced that Hogan’s the right man for the job as they believe he’s a liability, unhinged and incompetent as five months prior Hogan had been tortured and left for dead by one on the world’s most wanted terrorist Youseff Selim, who the JIA suspect of having some involvement with the attorneys kidnap. Hogan sees this as an opportunity for revenge and begins his search with some unlikely leads, he isn’t convinced that the kidnap of the attorney is by Islamic terrorists as the police and FBI initially suspected. Hogan’s relentless journey for the truth leads to a string of lies and deceit that surrounds the real reason for the kidnapping and once again Hogan finds that his life is on the line. Will his mission succeed? Or will it fail? There are plenty of twists and turns to keep you guessing as the pages are turned in this fast paced espionage thriller. Carl Logan: Special field agent. He has a back story that unveils itself throughout the chapters. Trained extensively in martial arts, instructed in knifes, handguns, rifles and psychological training that will help him stay alive. Charles McCabe: One of six commanders to the Joint Intelligence Agency (JIA) Also Carl Logan’s boss for 18 years. Frank Madena: Attorney General to the USA. Youseff Selim: Biggest arms dealer in the Middle East linked to many Islamic extremists and one of the worlds’s most wanted men. Richard Blakemore: Drugs and arms dealer. There are several distinctive voices and the conversations tend to stay on track within the chapter parameters. The dialogue is natural and flows well throughout the whole book with no signs of forced and unnecessary speech patterns. 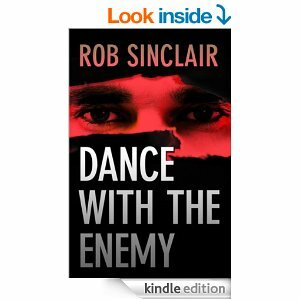 Dance with the Enemy is a superbly written Espionage thriller and deserves to be placed at the top of any Crime/Thriller/Action list and I imagine it’s just a matter of time before this book becomes an international best seller. R. Sinclair is a genius story teller with an exceptional imagination, not only does he introduces us to a real life likable heroin, he also leaves the reader hungry for the next instalment. This is a fast paced breathtaking edge of the seat thriller with plenty of twist, turns, thrills and excitement to keep the reader guessing and anticipating what will happen next and I would recommend it to anyone who enjoys crime fiction.